Deanne Wortman, a printmaker, was hired to lead the College of Engineering's new Nexus of Engineering and Art program, one that puts the college at the forefront of a national trend. 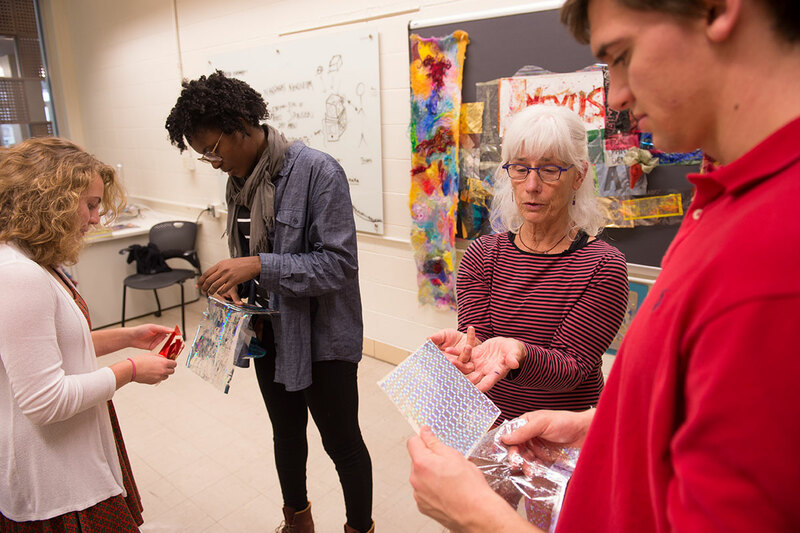 Wortman will help students learn how to use the Iowa Foil Printer (IFP), a machine invented by Virginia Myers when she was a professor at the UI, and she sees opportunity for jam sessions, improv, crocheting and knitting, creative writing, ceramics, and much more. Photo by Tim Schoon. Until August, Deanne Wortman had never organized her life on a planning calendar. That’s when the printmaker and adjunct professor was hired to lead the University of Iowa College of Engineering’s new Nexus of Engineering and Art program, one that puts the college at the forefront of a national trend to encourage interaction between students and faculty from both disciplines. Now, Wortman often finds her schedule overbooked. But, she says, it’s wildly exciting to be part of an idea that’s new to college campuses. Melding engineering and art is the way great thinkers have always worked, Wortman says. The UI College of Engineering is forging into uncharted territory with its commitment to include the arts as a component of its undergraduate education. In May 2015, college faculty approved a general education requirement that all new undergraduate students take at least three semester hours in the creative arts. The college is also creating a Project Design Studio, a unique, hands-on “maker” classroom unlike any other on campus. It’s part of a $37 million addition to accommodate growing enrollment. Ground breaking is scheduled for early next year. Alec Scranton, dean of the College of Engineering, said he was inspired to make his idea for Nexus a reality after realizing how meaningful it could be to students. The Nexus program is part of that something more, says Associate Dean for Academic Programs Keri Hornbuckle, who also sits on the campuswide Arts Advancement Committee. Exposure to the arts is important because the college’s curriculum evolves to meet the needs of its students. She says inclusion and immersion in the arts has been met with enthusiasm by both students and faculty. Deanne Wortman exposes engineering students to a foil printmaking stamper. Photo by Tim Schoon. Alan MacVey, co-chair of the Campuswide Committee, chair of the Department of Theatre Arts, and director of the Division of Performing Arts, says the College of Engineering is doing what most other institutes of higher education are only talking about. “It’s an unusual thing, certainly in Iowa,” MacVey says. “There’s a new recognition that the arts aren’t just things you go see, but actually are very useful to students in all kinds of disciplines. There’s a lot of talk about how important incorporating them is and how challenging it is. Wortman is full of ideas and exudes enthusiasm. She sees only opportunity in a program that has few defined lines—very much in keeping with her curious nature. While a key part of her job will be helping students learn how to use the Iowa Foil Printer (IFP), a machine invented by program namesake Myers when she was a professor at the UI, Wortman sees opportunity for jam sessions, improv, crocheting and knitting, creative writing, ceramics, and much more. A detailed look at one of the foils created. On Nov. 5, she will take part in a roundtable discussion in Des Moines called “Creativity Connects,” sponsored by the National Endowment for the Arts and the Iowa Arts Council. This discussion will help develop an NEA roadmap for how the arts can connect with other sectors that utilize creativity. Sunil Iyengar, research and analysis director for the NEA, said the arts are an “inevitable bedfellow with engineering.” Research has shown, he says, that involving students in the arts as the College of Engineering is doing gives them a broader base from which to learn. “The arts can engage people in the sciences perhaps more effectively than science alone. That’s a key part,” he says. And, Wortman says, she hopes to engage students in a way that makes them even more excited about their field of study. Who is Virginia A. Myers? Virginia A. Myers is a professor emerita in the University of Iowa School of Art and Art History and a renowned printmaker. She came to Iowa City in 1955 to study with artist Mauricio Lasansky, who became known as one of the fathers of 20th-century American printmaking. After studying in Paris on a Fulbright Scholarship from 1961 to 1962, Myers joined the faculty at UI where she taught printmaking. In 1983, Myers began researching the use of gold leaf and foil in the printmaking process and discovered that foil was strictly commercial and was not being used in the fine arts. Her dissatisfaction with foiling options available to artists led her to invent the Iowa Foil Printer (IFP), a device that allows artists to incorporate foil stamping into their work. The printer applies heat from both the top, via a printer roller, and bottom, via a hot plate. Using heat and pressure from the roller, foil or roll-leaf can be applied to a variety of mediums, including paper, metal, leather, and plastics. 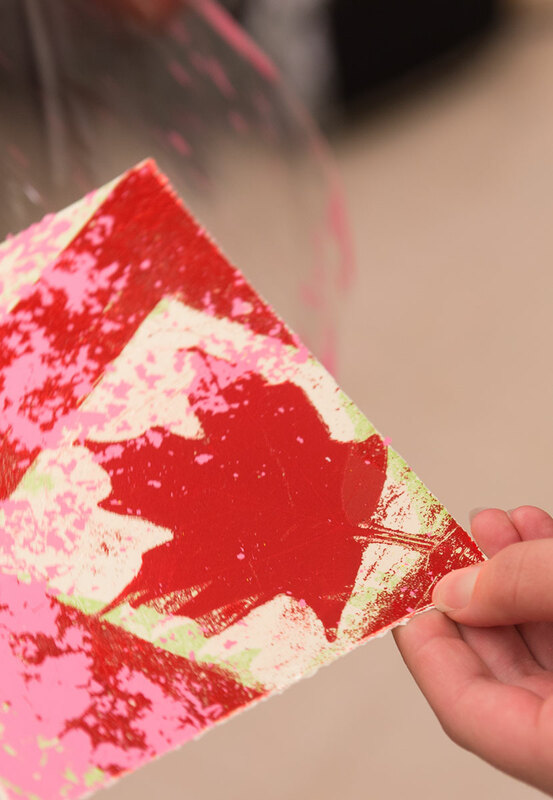 The foil or roll-leaf is adhered to a plastic film and is then transferred to the medium during the printing process. The foil is available in a variety of metallic, pigments, pearlescents, tin foils, and holograms. Myers and her former students, like Deanne Wortman, continue to develop and perfect hot-stamped foil techniques in original works of art. Myers lives in Iowa City.